Theodore Gribble was a native Wacoan born April 10, 1894. He attended Waco’s public schools and then graduated from Austin College at Sherman in 1914. From 1931 to 1945, he served as trustee of that same college. Theodore’s brother, Robert Francis Gribble, was a well-known Presbyterian pastor and professor whose legacy can be explored in a collection of writings and correspondence at the University of Texas. After graduating, he moved back to Waco and was hired by First National Bank where his father had been a long time employee. He worked there until he enlisted in the Army in 1917. 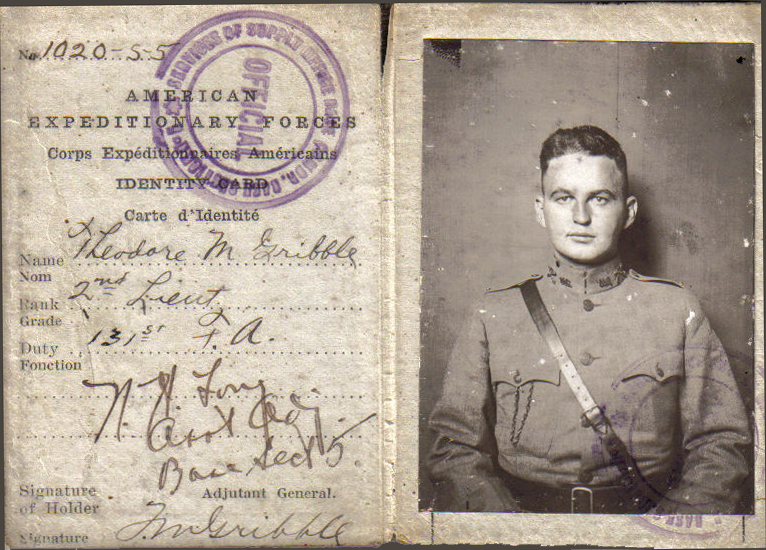 As a soldier, he went to France and was attached to the 36th Division until his discharge in 1919. The Division was also known as the “Texas Division” and Gribble saw action in the Meuse-Argonne Offensive, and battles near St. Etienne and the “Forest Farm.” These battles proved significant in the capture of German soldiers and ending the war. Gribble achieved a level of notoriety in Waco for his participation. At the end of WWI, Gribble was ranked as a Captain in the Adjutant General’s Department. During the Roaring Twenties, Gribble changed careers a few times. He worked in banking for a short while. Then he worked as vice president for the Price-Booker Manufacturing Company which became the largest pickle producer in the Southwest. 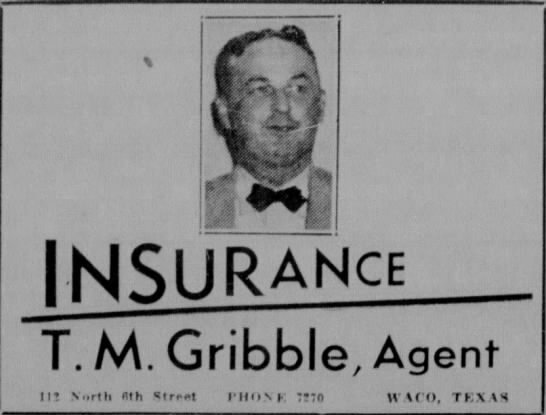 Gribble then switched to insurance in 1924. He made his slogan: “Insure and Be Sure. We believe in Waco.” His office was near where Café Cappucino is located today. 1941 saw Gribble being elected as the first native mayor of Waco. One year later, he re-enlisted with the Army and served in the Adjutant General Department. In 1943, he was promoted to Major and worked as Chief of the Officer Procurement Division in the 8th Service Command. In February 1944, he became Director of Personal Affairs in the same command until he retired as a Lt. Colonel in October of 1945. Gribble was active at First Presbyterian Church for several decades. As a Mason, he was very involved and served in several roles for the various bodies. As master of Waco Lodge, Gribble oversaw our 85th anniversary which included a banquet at the old Karem Shrine building at Washington and 7th. 400 people attended and the Bel Canto Quartette of Dallas performed. Gribble was recorder at Waco Commmandery No. 10, helped to plan the Karem Shrine visit by Harry Truman, served as potentate of that Shrine, et al. Gribble’s mother was Lucy Sleeper of the Waco pioneer Sleeper family. Gribble and his wife lived in the historic Sleeper home until selling it in 1952 at which point Gribble built a new home which can still be seen at 617 Fitzpatrick Avenue in North Waco.